Back in high school, my classmates and I were always told by our teachers: Ang kabataan ay pag-asa ng bayan. It was a statement that became incredibly cliche and tired after quite some time, to the point that we’d use it just to finish required essays or papers. We knew the quote existed. We got its meaning. The problem was, we weren’t exactly sure whether to believe whatever it meant. Us? A bunch of 15 to 18 year olds, the hope of our country? It made zero sense for us. We couldn’t even finish our essays without being cliche. We had a tough time just passing our classes with flying colors, suddenly, we were being built up as the futures of our ailing country. It impossible. It was the 7th of August 2018, when I found myself waiting for the BGC Bus coming from my internship. This was the daily grind I had been facing for three straight weeks. Wake up at 6:30, take a P2P to BGC, get down by Kalayaan, walk to the office, work, then get out by 6:00 to take the reverse route. Repeat. All of this, for the sake of finishing internship hours, and from the bigger picture of things, finally graduate and be part of the real world. Hopefully, make a difference, be the hope of a country. It still held true, even three years removed out of the High School system. Ang kabataan ang pag-asa ng bayan. But with every difficult commute I took, whatever self-confidence I had in myself wavered. This didn’t seem like it was worth it. The same could be said when it came to my basketball fandom, especially from the Philippine National Team side of things. At that point, it had been a rough few months for the cause of hoops in the country. It started at around late May, as projected heir to Jayson Castro, Kiefer Ravena, was suspended by FIBA for consuming a sports drink that contained ingredients deemed illegal by the sporting body. To make things even worse, a month later, the National Team was involved in a program-changing incident due to its brawl with the Australian National Team. Of course, sprinkled in were the usual cases of missing players due to one reason or another, and lack of preparation our teams had for international competitions. Puso. Tiwala. Laban Pilipinas. We always used these as battle cries. But failure after failure, our hearts bled, while the hope we had to fight and cheer for our country grew weaker and weaker. Why believe? Why show heart? Why fight? That 7th of August 2018, our National Team found itself in quite a battle versus the Chinese National Team. The difference was, this wasn’t the Senior National Team in battle. Instead, it was our U18 team, Batang Gilas, that was set to battle in Thailand for the FIBA Asia U18 tournament. I sat in the stop of the BGC Bus, focused on the game rather than the ride that would bring me to EDSA-Ayala. I had mixed emotions of both fear and hope as I followed the game. Fear. You have to understand, the U18 tournament had been one of the weak points of the National Team program for the last few years. Not once had we qualified for the U19 FIBA World Cup, and our losses versus big teams in past U18 tournaments were often monumental. South Korea was a painful adversary. Even Thailand upset us during the 2016 edition. Of course, China was always a dominant force, the result almost always a blowout loss when we’d face them. Like years past, this Chinese Team the 2018 U18 team was also loaded with talent. Leading the way was UPenn commit Quanze Wang, an 6’10” offensive force who was skilled enough to create from the outside, but burly enough to score from the inside. Helping him out was wingman extraordinaire Guo Haowen, along with a bevy of talented guards and forwards. Same old China. A big loss somehow felt inevitable. Operative word: somehow. Hope. This wasn’t just the blind hope Filipinos have gotten used to throwing around to our National Teams. For once, this positive feeling had value to it. We may have had struggled in past U18 tournaments, but something felt different with this particular group. It started with its front court, the Manila Skyline as they have been aptly dubbed. Kai Sotto was a 7’1″ wunderkind, who wasn’t only a wonder because of his height, but also because of his high basketball IQ and incredible feel for the game. Beside him was 6’11” gazelle AJ Edu, the type of versatile athlete fit to help Kai out on both ends of the floor. The backcourt also had talent. 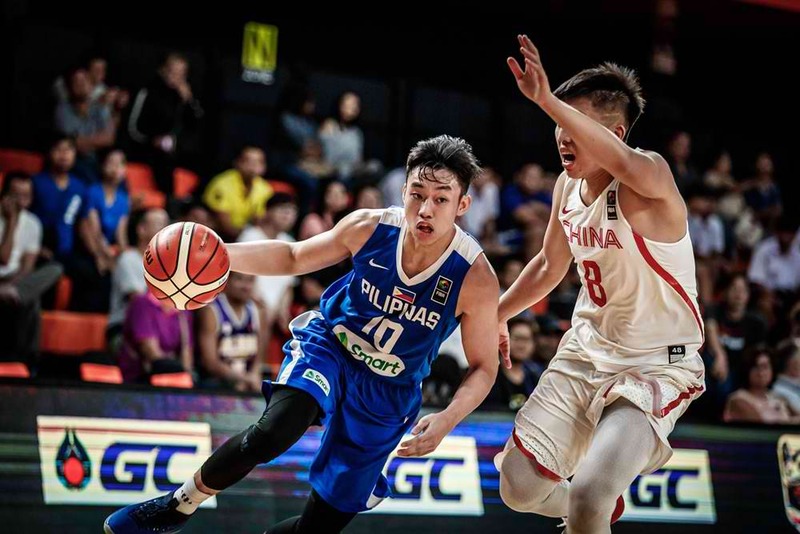 Matching up with Haowen was Dave Ildefonso, a scoring wing who had made his mark with the Ateneo Blue Eaglets in the UAAP Juniors Division, and beside him was Dalph Panopio coming from Italy. He was a mystery, but his mere resume was convincing. He came from the Stella Azzurra basketball program, dazzling as an elite point guard who could control a team no matter what. Kai, AJ, Dave, Dalph, and eight others players all with the same amount of responsibility in representing a country. Facing them was a big red machine, a battle that felt impossible to conquer. Would they waver? Would they give up and throw the towel before the fight even starts? As I hopped on the BGC Bus on the way to my next stop, the game began between both the Philippines and China. Anxious energy could be felt around the body of the gentleman who had his earphones on while watching the game. For the record, that was me. I was the only one even brave enough to bring out my cellphone while others kept their devices heavily protected from snatchers. I wasn’t thinking about the probability of my phone getting snatched at that moment. This was the least I could do to support my countrymen, showing some form of defiance as small as it may have been. As the game rolled on, my anxiousness slowly went away. It started with a Kai skyhook versus Quanze. Then AJ connected on a number of backdoor plays to add to the total of Batang Gilas. Dalph continued to show steady playmaking, with shades of Batang Gilas legend Matt Nieto with the way he handled himself. Dave did what he did best; score, and in the explosive way only he could do in his age group. It all felt like a blur as I watched. Little did I know, I already arrived in EDSA-Ayala, only to find myself in Dunkin Donuts stress eating on some Choco Butternut and Iced Coffee. From there, I rushed to the P2P station in Glorietta, with zero knowledge of whether I was bumping into anyone as I watched the game. I finally found myself seated in the P2P after all of the madness. Yet, despite that, Batang Gilas stayed in the driver’s seat, up by 18 points at one point courtesy of back to back threes by Dave. This felt too surreal. 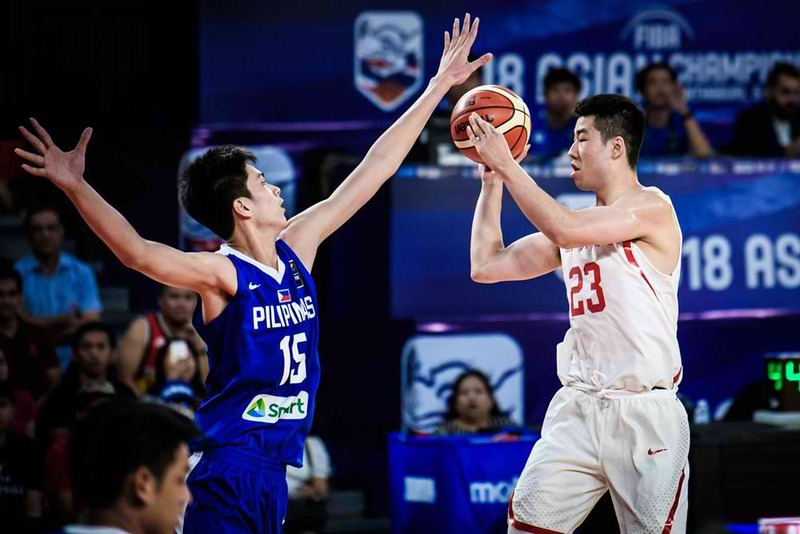 Batang Gilas was in absolute control, against China, of all teams. I couldn’t help but smile, maybe even letting out a few tiny shrieks here and there as the game went on. This felt like a moment. I was hoping it was going to be one. Maybe “absolute control” was being too cocky about it. A few minutes later, the threes of the Filipinos stopped falling, and the Chinese started to make their shots. The score was suddenly down to just 60-52, with three minutes left on the clock. “PUWEDE BA FIRST TO 60 NA LANG TO? ?” I exclaimed internally in that moment. I didn’t want it to slip away from the country’s hands. I didn’t expect it to completely change the tide of Philippine Basketball, but at the very least, it could give us some positive reinforcement to hold onto. Amidst the brawls. Amidst the suspensions. Amidst the heavy traffic we faced as we made our way to Eastwood in that P2P. At the end of it all, hope is what we can hold on to, and fuel us when facing the most difficult of tasks. Batang Gilas just needed to remind defiant and hope. Last three minutes. Those last minutes came out like a blur once more. AJ and Raven Cortez hit timely baskets to add to the total of the Philippines, but the Chinese remained aggressive, cutting the lead to as low as six with two minutes remaining. Hope. Just hope. 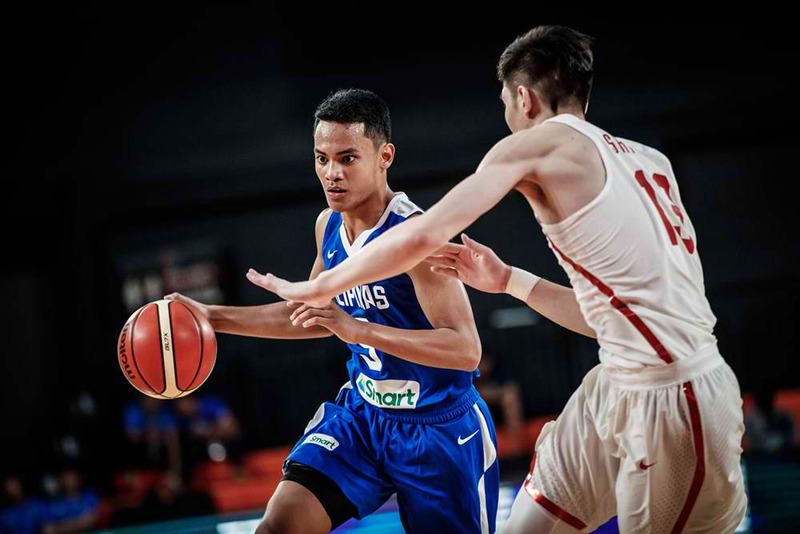 Batang Gilas continued to battle it out, with Dalph connecting on a jumper, and Kai blocking a shot from rival Quanze. With 43 seconds left, Batang Gilas found itself up, 67-59. China was placed in a corner, forced to play the foul game from there on out. This was it. The Philippines was really going to beat China for the first time in the U18 level. The buzzer finally sounded. 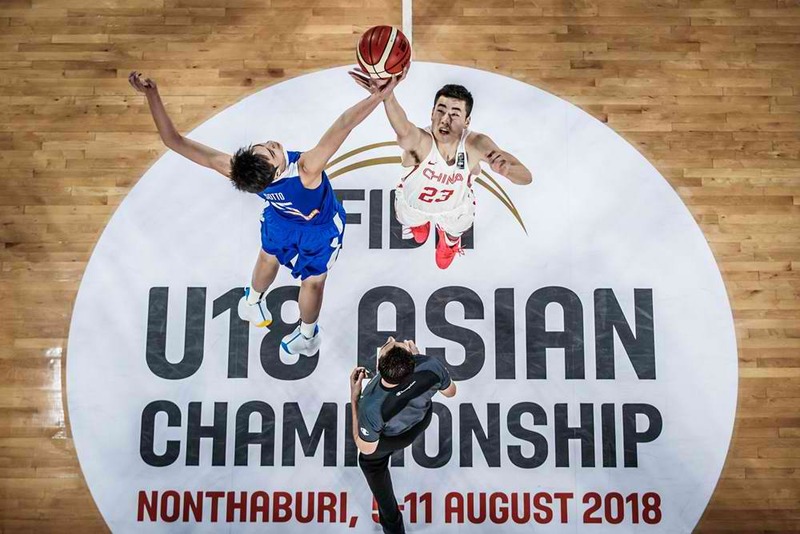 The score read 73-63 in favor of the Philippines, clinching the first seed Group B to assure itself a slot in the Quarterfinal round of the FIBA Asia U18 tournament. Here’s the reality the country was facing in that moment. For the team, a spot in the World Cup was not yet assured at that point. Batang Gilas still had to win its next game in order to secure that slot, so more work had to be done. For the rest of us Filipinos, life remained the same. I still sat in that P2P, stuck in Ortigas as traffic was at a standstill. I still had to wake up at 6:30 to go through the same grind I had been on for the last few days. Things remained difficult from the outside looking in. In that moment though, there was hope for the future of Philippine Basketball. The kind of hope that hadn’t been lit up for quite some time after facing a string of controversies. We had beaten not just any team, but China, a group that had bullied us repeatedly in past U18 tournaments. Puso. Tiwala. Laban Pilipinas. Most importantly, ang kabataan ang pag-asa ng bayan. Kai. AJ. Dave. Dalph. Batang Gilas. It all made sense in that moment, as irrational as it may have seemed. There was hope in the youth, and that in itself should inspire all of us to keep moving forward, heavy traffic be damned.